For use on Stressed Plants, Vegetable Gardens, Flower Beds, Lawns & Compost Bins. Humic Soil Activator is made from humates, very compressed plant and animal matter dating back to prehistoric times. The product also contains trace amounts of minerals, as well as carbon, chlorophyll, protein and humic acid. Humates help soil increase its water holding capacity and resist drought. Helps to aerate the soil, making it easier to work with heavy clay soils. Not a fertilizer, but increases the effectiveness of your fertilizer. When you leave the clippings on your lawn eventually, they decay and help provide nutrients for the soil. Soil Activator enhances that process, helping return nutrients to the soil more quickly, promoting their uptake and boosting the growth of beneficial micro-organisms. It also improves the structure of the soil. 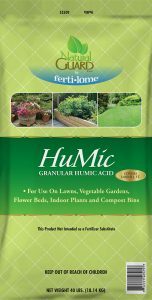 Humic promotes up to 30% more root development in emerging grasses, while also enhancing later fertilizer applications. Among other uses; it is recommended as an every other month treatment for lawns in combination with Watters All Purpose Plant Food. This treatment, applied from March to October promotes the growth of a rich lush lawn that is virtually weed free. Covers 2,000 Square Feet. Water in after application.